Goffstown firefighters work to contain a heating oil spill from a delivery truck Sunday. Officials are taking precautions after a heating oil spill near Goffstown's drinking water reservoir. It came from an Irving Oil delivery truck that crashed and tipped over Sunday morning. The truck spilled as much as 1,100 gallons of oil near a stream that runs into the local reservoir. The driver was uninjured. 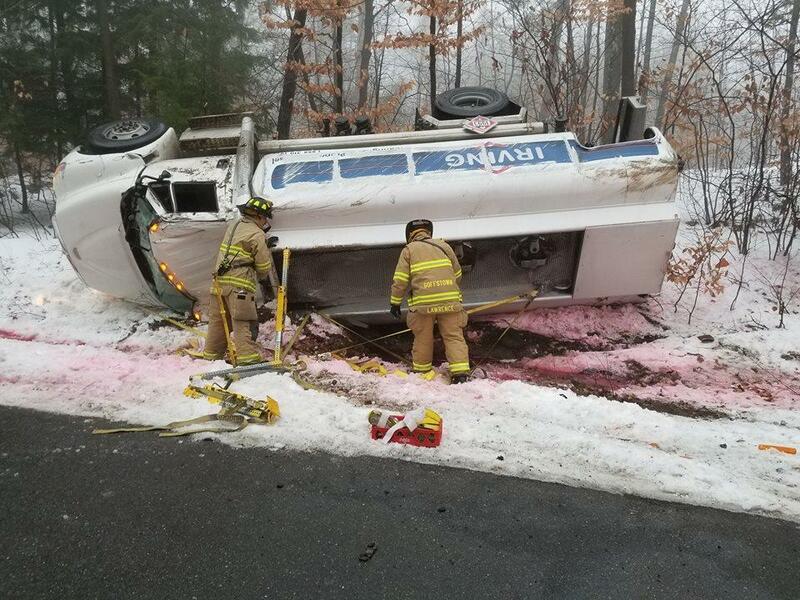 Officials believe the crash, on Mountain Road, was caused by icy conditions. Local firefighters, private contractors and state responders removed most of the oil and contaminated snow and sediment on Sunday and Monday. But state spill response administrator Bob Bishop says the rain in the forecast could complicate things. "We are concerned about runoff, now, of some remaining contamination that we're still working to remove, but we put some different dams and absorbent materials in place to prevent that from happening,” Bishop says. Monitoring and cleanup will continue in the coming days. Bishop says he doesn't believe the spill poses a major threat to the town's drinking water. It's not clear yet if the spill will prompt a groundwater investigation. It’s not the largest heating oil spill the state has seen in recent winters. Bishop says slick roads and lots of oil trucks driving on them mean such incidents are not unexpected in winter. State officials say it could be weeks before they have a long-term cleanup plan after an oil spill at the Omni Mount Washington Hotel. The spill of heavy, number-6 heating oil happened in June, near one of the hotel's boilers. State waste management director Mike Wimsatt says the fuel, also known as bunker oil, may have been soaking into the ground there for some time without the hotel's knowledge. More than 100 responders from dozens of state, federal and local agencies were busy in Portsmouth Thursday, practicing their response to a hypothetical oil spill. These exercises happen every year on the Piscataqua River between New Hampshire and Maine – but the made-up crisis they game out is always changing. Carroll Brown is New Hampshire’s oil spill contingency planner. He says this year’s scenario imagined flying debris from a winter storm, rupturing an Irving Oil diesel tank on the riverbank in downtown Portsmouth. The Coast Guard and other agencies are finished cleaning up oily water that discharged into the Piscataqua River earlier this week. The Coast Guard says the discharge came from the National Oceanic and Atmospheric Administration's Ferdinand R. Hassler ship on Tuesday. The Coast Guard says clean-up concluded on Thursday with assistance from NOAA, the New Hampshire Department of Environmental Services and Enpro. Assessments of the shoreline found no impacts to wildlife.